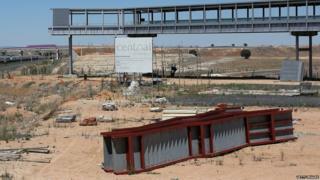 A group of international investors has won a bankruptcy auction for an abandoned airport in central Spain with a €10,000 (£7,000) offer - 100,000 times less than it cost to build. The investors were the only bidders for Ciudad Real airport, south of Madrid, completed during Spain's boom years. But it is not clear if the sale will go ahead as another buyer could still step forward outside of the auction process. The winning bid was made by a Chinese-led consortium of investors. The group, Tzaneen International, says it wants to make the airport an entry point into Europe for Chinese companies. Ciudad Real airport, located 235km (146 miles) south of Madrid, was meant to be an alternative to Madrid's Barajas airport. It cost more than €1bn to build. It opened in 2008 but went bankrupt and closed in 2012. There is still a possibility that another buyer could meet the minimum price of €28m set by the receiver for the sale to go through before the end of September. The central Spanish airport has a capacity for 2.5 million passengers per year. It is one of a number of "ghost airports" constructed during Spain's building boom that did not attract enough passengers. A similar fate befell Castellon airport in the east. It opened in 2011 but received its first flight only this year. Correction 24 July 2015: This report has been amended to make clear that Castellon airport is now hosting flights.